Polyester Strap is designed for medium to heavy-duty palletizing and unitizing applications and can be applied by hand tools or power strapping equipment. This strapping material yields higher break strengths and maintains a higher level of retained strap tension than polypropylene strapping and is therefore the ideal material to replace steel strap. It is commonly used for palletized loads, such as PET bottles, to prevent product shifting during handling and transit. 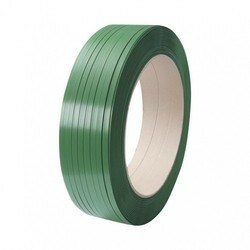 Looking for Polyester Strap ?